The factory fog lamps are wired to illuminate only if the headlamps are on. They also shut off when the high beams are activated. I prefer to have the ability to switch on the fogs when only the parking lamps are on and I like them to stay on while the high beams are activated. To accomplish this, remove the fog light relay located in the engine compartment fuse panel and bend its top prong so that it no longer inserts into its usual location. That was where it was getting power from the headlamps. Take a short piece of 14 gague wire and crimp on a female quick disconnecting terminal with a 0.187 inch tab. Do not try to use a standard 0.250 inch tab disconnect because it will not fit tightly enough. Connect the disconnect to the top prong of the fog light relay (the one you just bent). Run the other end of the wire to the left side of the 10amp taillamp fuse. Now power is available to the fogs when the parking lamps are on and they do not stop receiving power when the high beams are switched on. This mod, when performed on 2000+ model year 4Runners, has no change at all in the operation of the fog lamps. The 2000+ Runners come standard with daytime running lights (DRL's) and Toyota has prevented the possibility of operation of the fog lamps during the time DRL's are on. Chuck Konarske, a 2002 Sport Edition 4Runner Owner, has came up with a solution for 2000+ models years. "After doing your mod, owners of the 2001-02 model year trucks need to locate the green and black wire in pin #16 of the connector to the DRL relay, relay D8. It's located just to the right of the steering column, down near the driver's right shin. This wire needs to be cut a couple of inches away from the connector, extended and grounded to a convenient point. I use the lower bolt of the driver's side fuse box as an easy-to-reach ground. Tape off the piece toward the connector and you're all done. It's easy enough to do without diagrams as long as continuity is checked between pin 16, in the D8 connector, and the number 2 coil connector in the fog lamp relay socket, with the fog switch on. Turning it on and off will drop continuity, proving you have the right wire." 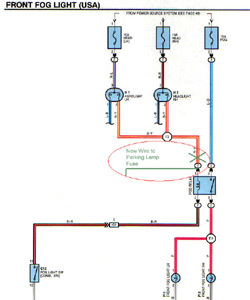 Here is the 2002 Fog Lamp Circuit Schematic Chuck sent to me. "The pin # you reference for the D8 connector from the DRL relay is different. It is pin #14 not #16. The color is still Green with a Black Stripe. Besides that the mod worked great. I checked continuity between pin #14 and the #2 coil connector in the foglight relay before completing the mod. I also decided to install a switch in my DRL's. It was pin #2 in the D8 connector, Black with a Yellow stripe."